This image of the Buddha by Jack Kerouac, created before the wild success of “On the Road,” presents a stunning contrast to the paintings of yesterday and the day before. It comes at a time when Kerouac was fully engaged in life, creatively and spiritually. The year was 1956, and Kerouac was deeply engaged in Buddhist study, probably while he was living with his sister, Caroline, just outside Rocky Mount, N.C. (my hometown). In this quiet place, surrounded by farmland, he spent many nights studying and writing notes for his book, “Some of the Dharma,” his poetic exploration of Buddhism, published much as he created it with haikus, pyramids and other shapes, drawings and margin notes, in 1997. This sketch reflects the focus of those days, with a hopefulness not present in the later paintings. While the Buddha is dark, his gently upturned mouth, the graceful curve of his eyes and nose, the hint of a third eye, the wisdom eye, between them — show Kerouac’s abundant creativity and imagination. In this sketch he is seeking to understand and end samsara, the cycle of birth, death and rebirth, by understanding the physical face of the Buddha, an avatar of that peace. He wants to uncover these answers and share the secrets, as he did with his writing, as he did through his life, until drink and stagnation drew him downward. ABOVE: Jack Kerouac. 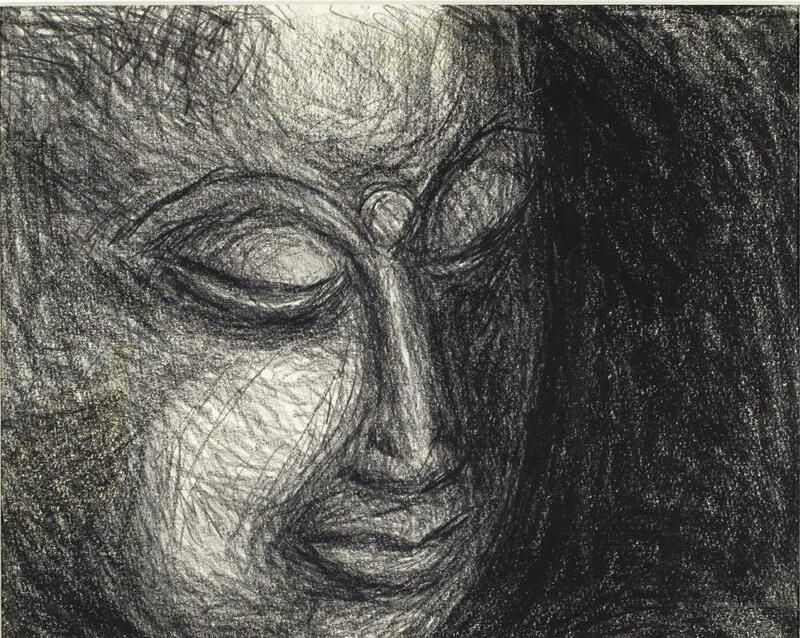 “Face of the Buddha.” Pencil on paper, 1956(?). New York Public Library, Berg Collection. Reproduced courtesy of John G. Sampas, legal representative of the estates of Jack and Stella Kerouac. On view as part of “Beatific Soul” through March 16, 2008. This entry was posted on March 6, 2008 at 6:08 am and is filed under Uncategorized. You can follow any responses to this entry through the RSS 2.0 feed. You can leave a response, or trackback from your own site.